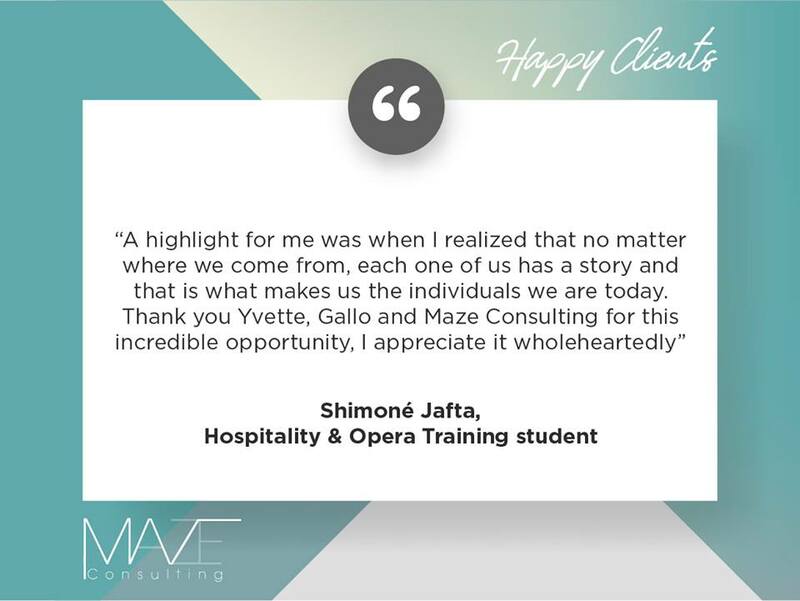 "Maze Consulting completed our Opera Training for some of our team members. I found Melanie van Wyk extremely thorough in her approach prior, during and after training. She ensured that all aspects that we required to be trained on where covered. She took time out on her own, to spend with our Reservations team and FO teams to understand the challenges that are faced and to try and find a solution in terms of the training needs. Maze Consulting was extremely well prepared with their own laptops for the students, they developed manuals as easy reference during, and once training is completed. The training was concise, informative and interactive, best form of learning, with plenty of practical examples and input from the team. We look forward to our next training session, with Maze Consulting." many things. What I've learnt at Maze Consulting will forever be with me and will be able to help me in many situations that I may come across. 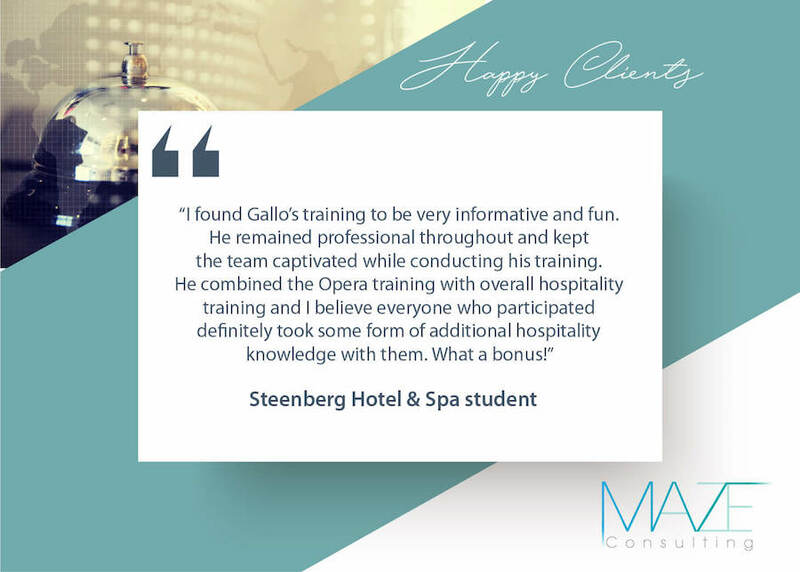 The people I've met like Mr Gallo Shanker and Ms Melanie van Wyk are just two of the wonderful people whom I'm sure will be able to teach you things that could help you succeed in the world of Hospitality. Yours sincerely An aspiring student"
"The Opera training to me was skillfully facilitated in an enthusiastic manner. The system is one of a kind and I discovered some exceptional functionality. The company Maze Consulting did a great job with the training, it was well organised by Mrs Van Wyk. She was very professional, an intelligent lecturer and supportive of all of us. Mr Shanker was a great mentor with inspirational speeches to reach our dreams and goals in the future." "My experience at Maze Consulting was amazing and will be with me forever. The knowledge that they are teaching are from personal experience. Mr Gallo Shanker, Mrs Melanie Van Wyk and Ms Wynette Hagan are a few of the amazing people who I came across and all together they want to empower students and are ensuring that student are developed in the industry." "Two very Important life lessons I have learnt while in training at Maze Consulting: 1. What becomes of your future is entirely dependent on you and the efforts you make today in order to see a better tomorrow. 2. Believe in yourself. Believe in your dreams, and in doing so surround yourself with positive people who believe in you. It warms ones heart to realise that in such changed times there are qualified Individuals who still believe in humanity and the betterment thereof. People who find time in their busy schedules to give back and Invest in young people, with great enthusiasm. My time at Maze Consulting was not only an opportunity to learn and absorb all that I can possibly imagine around hospitality but also a time in which I learnt about life, as well as what it means to have lived a fulfilled life. I have never met people who are as passionate about what they do as my trainers Melanie Van Wyk and Gallo Shanker. My perspective of Hospitality and the Industry as a whole has changed, I believe this will always be advantageous and a good acceleration for my career. I have learnt so much, and the amount of preparation both these Individuals have gone through were evident in every lesson and it forced the class to take both what was taught and yourself very seriously. I am certain that wherever I do decide to venture within this Industry I will become an asset because of their training. I am truly grateful for Mel and Gallo and all the amazing life lessons I will always carry with me. I will never forget their caring hands and willing hearts when it comes to motivating and developing young people. What I become is what I owe to myself, but I am certain that you have equipped me with enough to be a representation of the amazing work Maze Consulting does. Thank you for investing in me and all the young people’s lives you have changed." Liyabona Plaatjie, Amy Biehl student on Hospitality Management and Opera Introduction course, July – August 2016. Understood me and listened to my problems and motivated me in life. It’s because of your teaching that I am a responsible and successful person. I will always be grateful to you for all your support and inspiration and all the subjects you taught all our members. It was a your sheer dedication that I cleared the training and it was a great honour to work with you Mr.Shanker."